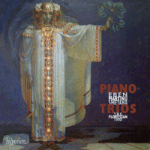 This month the Florestan Trio’s new disc is out on Hyperion Records. It’s a CD of three marvellous Czech piano trios by Smetana, Martinu and Petr Eben. It was a particularly arduous disc to record because all three works – though particularly the Smetana and Martinu – require a lot of physical stamina. In concert, short bursts of physical prowess are somehow within one’s grasp; under recording conditions, where you have to play things over and over again without any lapse of intensity, it’s hard to keep up the required energy levels. Nevertheless I think we all feel proud of the way this disc has turned out. This entry was posted on Wednesday 5th May 2010 at 8:21am	and is filed under Florestan Trio. You can leave a response, or trackback from your own site.